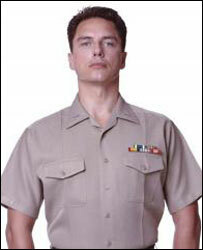 Actor John Barrowman explains why he swapped Doctor Who for a role in West End play A Few Good Men alongside Hollywood star Rob Lowe. With his snappy wisecracks, natty dress sense and grace under pressure, Captain Jack Harkness was one of the more memorable characters in the recent Doctor Who series. Thanks to his ambiguous sexuality and highly flirtatious nature, he was also one of its most progressive. "People said he was bisexual, but the show never put a label on it," says actor John Barrowman. "We didn't want to make it an issue." Still, the 38-year-old - who is openly gay - believes the character broke new ground and applauds writer Russell T Davies for including him in the programme. "We pay taxes like everyone else and are a big part of this society," he told the BBC News website. "It's about time more characters on television started representing what the world and our society are like." The good news for Who fans, or "Whovians" as they are sometimes known, is Barrowman will return as the dashing intergalactic conman. Not immediately, though. "I won't be in Season 2 but I will be back for Season 3," says the Scottish-born, Illinois-raised performer. "There was talk of me coming back for the next series, but because of the commitments I have it just wasn't going to work out." Barrowman is not kidding. Currently appearing in London's West End in A Few Good Men, he soon begins rehearsals for a Christmas pantomime that will open the day after his play finishes. Not only that, but he will shortly start filming a BBC One variety show - tentatively called Simply Musicals - that will air on Saturday nights in early 2006. The show will see him and other stage stars performing numbers from such West End hits as Cats, Chicago and Guys and Dolls. "It's important to bring theatrical stuff back to television," says the actor whose musical credits include lead roles in Andrew Lloyd Webber's Sunset Boulevard and Cole Porter's Anything Goes. "Licence fee payers want variety, and they're going to get it," he adds. For the time being, however, Barrowman has his hands full playing a Navy lawyer who crosses swords with Rob Lowe in Aaron Sorkin's 1989 courtroom drama. Filmed in 1992 with Tom Cruise and Jack Nicholson, the play deals with two Marines accused of murdering a fellow soldier and the inexperienced attorney assigned to defend them. "It's very good writing, if a little wordy," Barrowman says. "Not a night goes by where one of us doesn't trip over some piece of dialogue." The show opened earlier this week to largely positive reviews. However, some critics questioned whether a play partially set in the US military base at Guantanamo Bay, Cuba was appropriate given its current use as a detention centre for foreign terror suspects. The actor, though, refuses to draw such parallels. "This play is about Guantanamo Bay way before 9/11," he says. "It's not about prisoners of war; it's about the guys who are there to protect US borders. "I guess it's topical in that it's about the military, but there's no kind of political twist." From time-travelling American servicemen to quick-witted naval attorney, the former host of BBC TV's Live and Kicking programme has spent a lot of time recently in uniform. 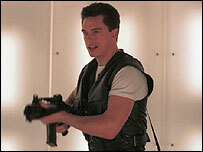 The trend continues later this year when Barrowman appears in the film version of Mel Brooks' musical The Producers. Appearing with Nathan Lane, Matthew Broderick and Uma Thurman, he plays the German stormtrooper who sings the iconic show-stopper 'Springtime for Hitler'. "It's going to be a phenomenally lush movie. They rebuilt a section of '40s Manhattan on a soundstage that made me gasp." So what will the Whovians say when they see Captain Jack sing? Barrowman is sure they'll approve. "Science-fiction is not that far from musical theatre," he says. "In the end, it's all just heightened reality." A Few Good Men runs at London's Theatre Royal Haymarket until 17 December.